projections are 0.5–3.0 m under RCP2.6, 2.1–7.0 m under RCP4.5, and 9.1–15.6 m under RCP8.5. projection range under low emissions but shifts and fattens it under high emissions." I've just been catching up on the IPCC 1.5 report, and was trying to find out the current projections for sea level rise, particularly in the case that their 1.5 degree pathways are followed. c) 6m-9m on the timescale of "centuries to millenia"
Can anyone help me out? what are the latest projections? Thanks a lot! p.s 6m-9m of SLR if we hold steady at 1.5 degrees! Wow! In their latest report, their expected sea level rise under such a scenario is 26 to 77 cm by 2100. They make no mention of millennial projections. Table 1 of Kopp et al 2017, attached below, gives a 17% chance of 78cm or more SLR in 2100 for RCP2.6 and a 5% chance of 98 cm or more (red lines are mine). TBH, looking at anything except the BAU pathway RCP 8.5 is a futile exercise. U.S.: The report warned that the Navy needed to begin protecting the most vulnerable facilities immediately, and had only 10 to 20 years to begin work on the rest. Seven years later, there’s been little progress. SLR is more along the East Coast US. AVISO updated GMSL through October 11. It has now been 4 years that the 2-month filter has been above the current linear trend of 3.3 mm/year. How long until it takes 3.5 mm/yr to fit the data? MAJURO — Facing possible extinction from rising sea levels, the Marshall Islands is for the first time focusing on how to raise islands in this atoll nation. The Marshall Islands aims to increase engagement with the three other all-atoll nations in the world — Kiribati, Tuvalu and the Maldives — to add momentum for “adaptation.” President Heine is chair of the Coalition of Atoll Nations Against Climate Change that represents these four atoll nations. They have not yet outlined specifics of how this would be achieved expect to have plans formulated by the end of the year. In the meantime, they are keeping a close watch on the ambitious City of Hope project on an artificial island in the Maldives as a viable option. To lay the foundations of the city—which is expected to accommodate 130,000 people when completed in 2023—sand is being pumped onto reefs from surrounding atolls and it is being fortified with walls three metres above sea level, which will make it higher than the tallest natural island in the Maldives. In line with this grand scheme, the Maldives government is in the final stages of negotiation with Saudi Arabia to lease Faafu Atoll, consisting of 23 islands, for development for 99 years. 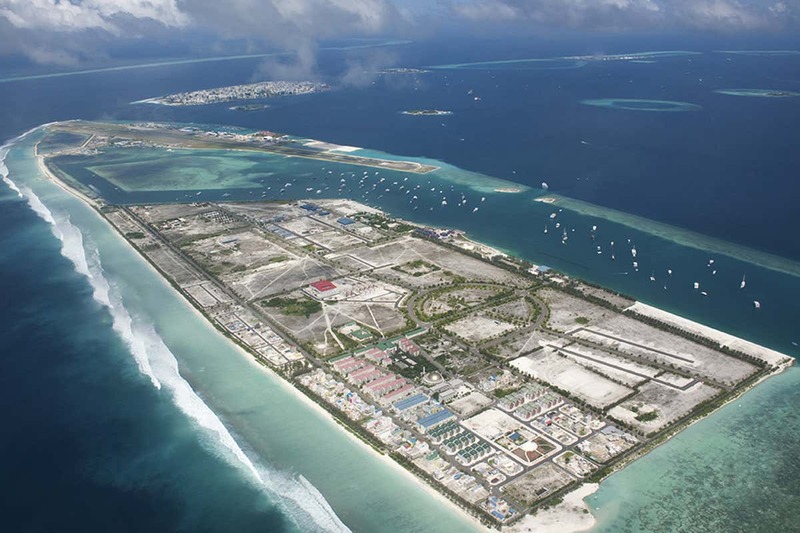 It could get about $10 billion – more than three times the GDP of the Maldives – from the deal, but will need to relocate about 4000 people. Although the islands’ population has been offered homes for free in bigger towns, some are still protesting the plan. Government officials told me that no one will be relocated against their wish. Researchers at William & Mary's Virginia Institute of Marine Science have issued the first annual update of their sea level "report cards," marking 50 years of water-level observations from 1969 through 2018. These web-based charts—available online at https://vims.edu/sealevelreportcard—project sea level out to the year 2050 based on an ongoing analysis of tide-gauge records for 32 localities along the U.S. coastline from Maine to Alaska. Release of this year's cards was delayed by the 35-day government shutdown, which precluded compilation of and access to NOAA's latest tide-gauge records. ... Boon and colleagues also use a statistical approach that includes evidence for recent acceleration in the rate of sea-level change at many U.S. tide-gauge stations, and stress their use of relative sea-level measurements—changes in water level relative to the land surface on which people live and work. 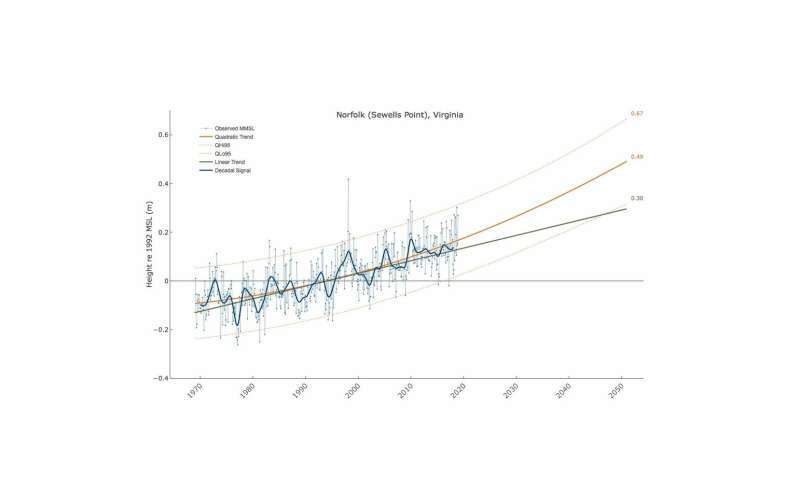 The relative sea-level rise in Virginia and other East and Gulf coast areas is due to both rising water and sinking land. ... a longer record isn't always better, especially when there's evidence of recent non-linear changes in the rate of sea-level rise like we see along the U.S. East Coast."... "If you cross a threshold in terms of something like sea-level rise, what came before—say a tide-gauge record that began in 1900—is biased in terms of seeing where you're going. We think the ice sheets are melting faster today than they ever have, and if that's true then the previous 90 years of data won't accurately predict the future." Yes, but the difference between the linear and non-linear rates are insignificant in the data, such that long-term extrapolations using one over the other is rather questionable. Are there reasons to suspect that there will be no acceleration of melt in Greenland and Antarctica in the three decades to come between now and 2050? I would think that the default assumption under continued rising temperatures, both for the ocean and the air, would be that the rate of melt should continue rising as the air and seas continue to warm. I'm pretty sure the answer is we are still in the bottom section of the S curve. The first ~75 years of the 1,000-year process (or however long it will take to melt Antarctica) is exponential in nature, but looks little different from linear. (I'm basing it on a 1970's start of the acceleration when global temperature increases functionally started.) A car that accelerates from 0 to 100 in 10 seconds isn't going very fast after the first second. History suggest SLR will come in surges or pulses and likely not liner or expontial. Ice mechanics .. say a cascading calving event from the Thwaites or else ware in the Amundsen Sea sector or even a saddle collapse, which is less likely .. from Greenland, might produce a pulse such as we have seen in the past as in Melt water pulse 1A. Ice does not need to melt to raise sea level just fall into the ocean.
" Students also painted the elevations of four intersections — 6, 7, 9, 11 feet (2, 2.1, 2.75, 3 meters) — along the city’s two-lane main road"